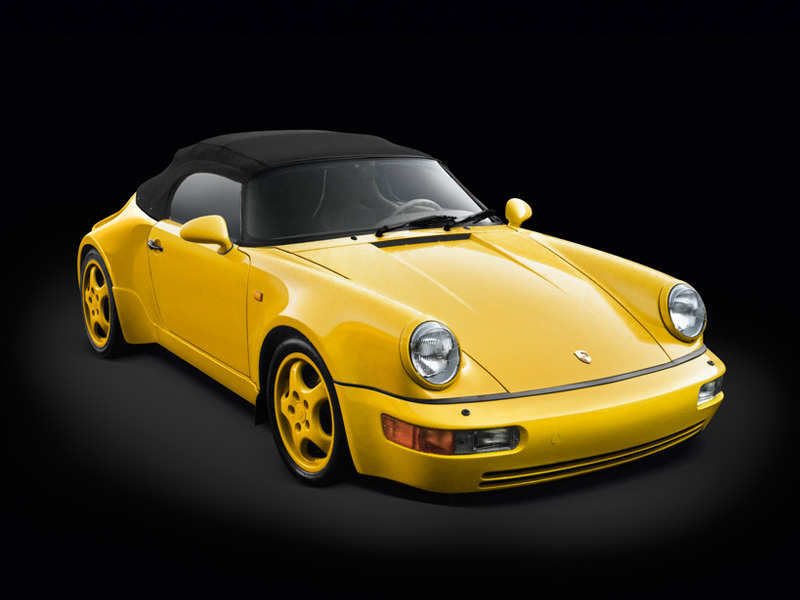 In contrast to the 911 Speedster from the 1989 model year, the 964 Speedster was only offered and produced with the narrow body shape. In December 1991, the first wide bodied prototype based on a 964 Carrera 2 Convertible Turbo-Look was registered at Porsche AG, but it never made it ready for a series production. In response to recurring customer requests for Turbo-Look Speedsters - the optical characteristics of the wide body in combination with the flat windscreen and fiberglass cover had found many fans - Porsche reacted with the possibility of converting the previously individually ordered, narrow Speedster in the exclusive department. Thus originated from the spring 1993 – on the 19. 3. 1993 a construction description of 964 Speedster Turbo-Look was fixed - in the special wish department "Porsche Exclusive" in the Werk1 up to 15 unique pieces with the wide car body - so with the interpretation of the option M491 = Turbo-Look (widebody) that already for the Anniversary Model 30 Years 911 and the C4 Widebody mostly only concerned body parts. However, in the internal data sheets for the Turbo-Look Speedster the option M491 was never noted and listed, still it was possible to consider the M491 with the order process. 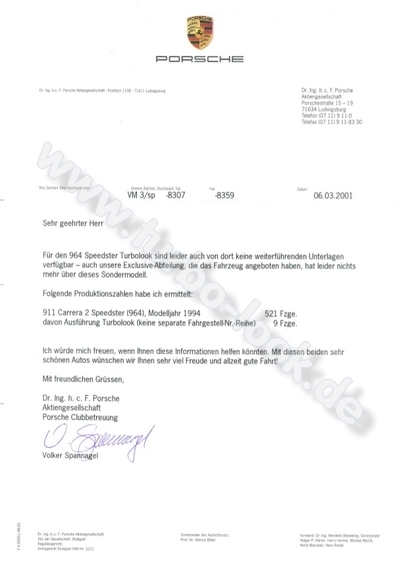 For his exclusive wish 25.875.- DM of surcharge were charged to the customer including sales taxes. 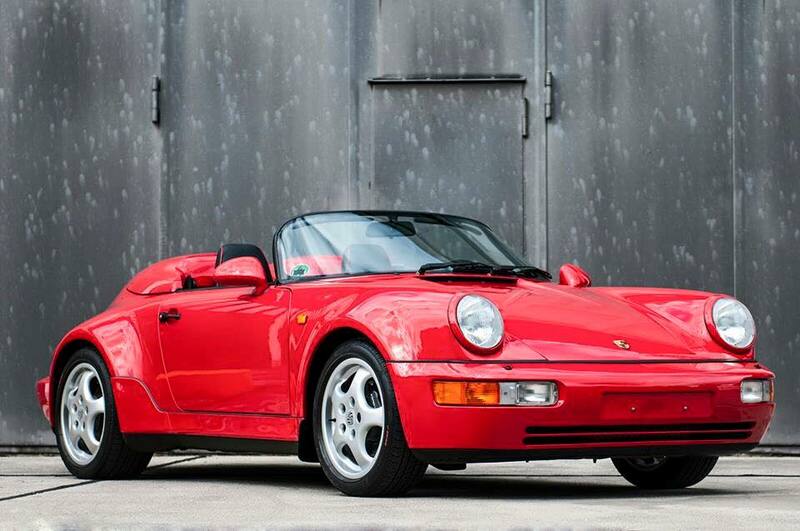 In sum (164.059.- DM) in comparison to the 964 Carrera 2 Cabriolet Turbo-Look (America Roadster) which was offered with 175.395.- DM base price, still a "bargain". The concerning Speedster-raw state coaches of the unique pieces were controlled out in the early phase of the manufacturing process, were transported in responsibility of the Exclusive department to the repair department and were widened afterwards with front fenders and metall widebody parts in the rear side panels by hand. In the connection they went through again the normal manufacturing process of spraying up to the final manufacturing. The technology like brake assembly, axels and chassis components of the Turbo found, in contrast to 964 Carrera 2 Cabriolet Turbo-Look (America Roadster), no use. In front one moved the standard suspension strut on work-sided with every 964 available external screw admissions in the chassis. In order not, like with early Turbo-Look and Turbo models to have to use to wide distance discs the rear-axle trailing arms and the rear wheel carrier of the Turbo-chassis were used. However, the threaded suspension including the shock absorber corresponds to that of the regular Speedster. Same is valid for the brake assembly. Here use was made for the front of the standard calipers and standart brake discs of the regukar Speedster, mounted on standard strut and the normal control arms, which are identical to those of 964 Carrera 2. The stabilizer for in front has 21 mm, rear 22 mm like the Turbo. The rear calipers correspond to the caliper of the Turbo 3.3, mounted in the shaft sections of the Turbo. However, the used brake pistons in the saddle correspond to that of the regular Speedster. The brake discs were as identical with the series Speedster. Because in front standard calipers and brake discs were mounted, besides, one used a weaker 33-cash valve to the balance of the brake balance. The before called number of pieces from up to 15 copies is verified by no document or any dependable source, still is to find out who brought this number in the world. Probably from unawareness of the true number of pieces it is called most frequent, however, varies also from source to source. 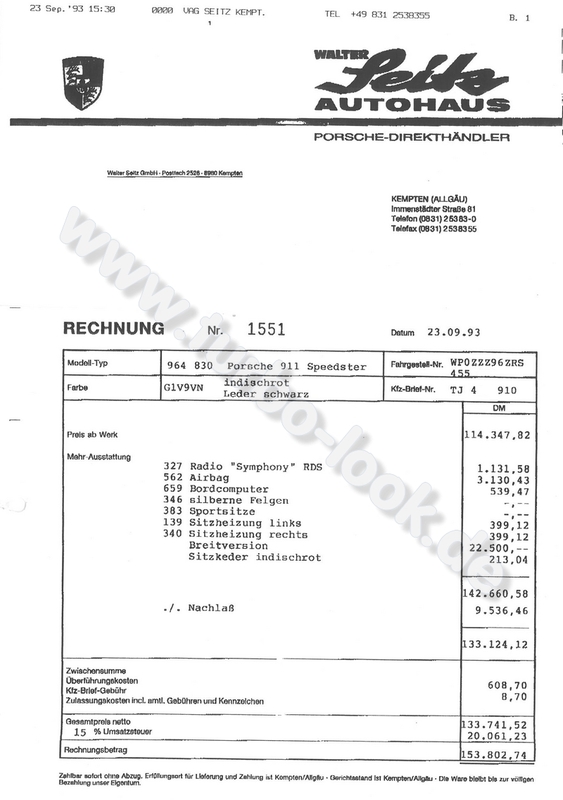 Remains to hold on that the numerical data according to Porsche also from 9 more than 14 up to 15 copies sway. Besides, the numerical data mix to the Turbo-Look Speedster with the number of the Strosek Mega Speedster wide rebuildings from which according to statement of the former secretariat also 15 copies should have originated. Summing up one can state only the fact that there are some 964 Speedster Turbo-Look rebuildings ex works and, besides, also such rebuildings of tuners or also from Porsche centres. 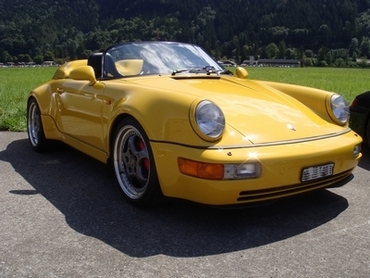 There are also numerous rebuildings of 964 Cabriolets to Turbo-Look Speedster. For many of these vehicles today's holders complain the possession one of few work vehicles, mostly "occupied" by the most fluorescent stories and dubious documents. 16771: SPEEDSTER TURBO-LOOK - UMBAU AUF TURBO-LOOK GEMÄSS ABSPRACHE ZWISCHEN VRS UND PAP - BAUBESCHREIBUNG VOM 19.3.93 - ACHTUNG: TÜV-EINZELABNAHME DURCH VRS (MANUELLER KFZ-BRIEF) ABRECHNUNG ERFOLGT DURCH VRS. Then with appearance of this text it will become quite possible to bring more light in the dark and to find dependable figures for spectacular 964 turbo-looks Speedster sometime once. To the turbo-look register are known currently six Speedster Works Turbo-look (WTL) obligingly.